Orbit Hotel is a budget hotel located in Shastri Circle, Udaipur. Being located in the heart of the city, one can explore the city by using Orbit hotel as the base. The USP of the property lies in the fact that it has an in-house restaurant, Udaipuri which is quite popular among the locals for the delectable cuisine. The rooms come in two categories, Deluxe AC and Family room. Of the 15 rooms that the property has, 10 rooms belong to the Deluxe category while 5 rooms belong to the Family category. Both these categories of rooms have attached toilet and are provided with satellite television. This hotel has the check-in and check-out time of 9.00 am and it also provides pick-up and drop-in facility from the airport. The railway station is at a distance of 3 kms while the airport is 22 kms away. Consumption of liquor is permitted but smoking and pets are not allowed inside the hotel. The hotel also provides help to the tourists in organizing their local and outside tours. Currency Exchange, Banquet Facilities, Breakfast Services, Doctor on Call, Wedding Services, Beauty Services, Security Guard, Restaurant, Room Service, Coffee Shop/Cafe. Direct-Dial STD, Reading Lamps, Iron/Ironing Board, Toothbrush/Razor on Request, Smoking Rooms, Internet Access, Air Conditioning Room, Climate Control, Cable/Satellite TV, Wakeup Calls. 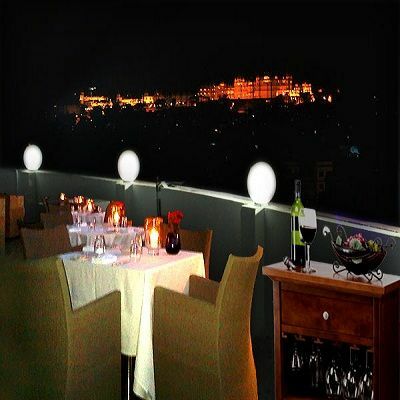 User reviews for "Orbit Hotel Udaipur"